A 21-year-old Newport Beach man was ordered Tuesday to stand trial on a murder charge stemming from the January killing of a former high school classmate, whose death has been deemed a hate crime by prosecutors because he was gay. Samuel Lincoln Woodward is due back in court Sept. 17 for arraignment. 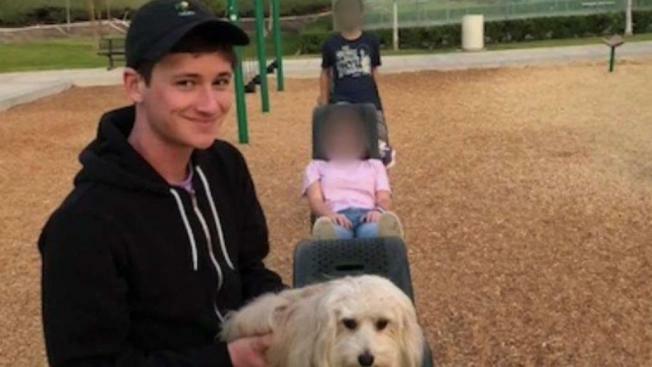 He is accused in the killing of Blaze Bernstein, a University of Pennsylvania pre-med student whose body was found in a shallow grave in Borrego Park in Lake Forest. Bernstein was home on winter break when he was killed. The murder charge against Woodward includes a hate crime allegation, meaning he could be sentenced to life in prison without parole if convicted. Woodward also faces a sentencing enhancement for allegedly using a knife in the killing of the 19-year-old victim. Woodward and Bernstein were classmates at the Orange County School of the Arts in Santa Ana and had reconnected through the social media platform Snapchat. "We will prove Woodward killed Blaze because Blaze was gay," District Attorney Tony Rackauckas said during a news conference last month announcing the hate crime allegation in the case. "The evidence was developed by examining Woodward's cell phone, laptop, social media and other digital evidence revealing the dark side of Woodward's thoughts and intentions." Woodward's attorney, Ed Munoz, previously said he and his client's family were "deeply disappointed" that the complaint was amended to allege the defendant carried out the killing due to Bernstein's sexual orientation. "This is a complex case and the motivations each of the principals brought with them to that fateful meeting are multi-layered and they're really complicated, so I guess from the narrow or selective view of the evidence this amended filing is not completely shocking," Munoz said on Aug. 2. Woodward has been diagnosed with autism, Munoz said. According to Rackauckas, Woodward picked up Bernstein from his parents' Lake Forest home about 11 p.m. Jan. 2 and drove him to a shopping center on Portola Parkway in Foothill Ranch. Later, the two went to Borrego Park in Lake Forest, he said. At some point, Woodward allegedly stabbed Bernstein multiple times, then buried the body in a dirt perimeter at the park, which is near the home of Bernstein's parents. Bernstein's body was found about a week later following a highly publicized search. A search warrant affidavit obtained by the Orange County Register in January suggested Bernstein may have tried to kiss Woodward, who responded by killing him in an act of rage. Rackauckas noted in January that state law does not allow prosecutors to attach a special-circumstance allegation to a murder charge in a case when a victim is targeted because they are female or gay. A special-circumstance allegation could lead to a possible death sentence.